One of the Majors, the AUD/USD is cross between the currency of Australia (Australian Dollar) and the currency of USA (U.S Dollar). Forex and binary options traders also call this pair the 'Aussie'. When carrying out currency trading activities in binary options, a trader will look at the market price of the pair that he/she wishes to trade, after compiling a relevant AUD/USD forecast. A market rate for the AUD/USD pair of 0.9417 means that it takes 0.9417 U.S Dollars to buy 1 Canadian Dollar. The Australian Dollar is the fifth most traded currency, and the AUD/USD forms part of the seven major currency pairs which comprises of the U.S dollar. Australia’s government is stable and the country is a major commodity exporter, making its local currency a valuable tradable asset. Just like other currency pairs which are affected by external factors, AUD/USD is influenced by the interest rate disparity between the U.S federal reserve and the Bank of Australia. The U.S Federal Reserve can take a decision to move in a particular way and alter the open market with the intention of bolstering the U.S dollar – thus making the pair’s market value decrease. Alternatively, the Bank of Australia could take intervening measures to strengthen the AUD, which would make the currency pair rise in value, a note to remember when carrying out currency trading activities on this pair. The fact that Australia’s and Canada’s economies are structures similarly and the fact that they are both major commodity exporters implies that they are positively correlated. By consequence, the AUD/USD has a negative correlation with pairs which have the USD as a base currency, such as USD/CAD, USD/JPY, and USD/CHF. 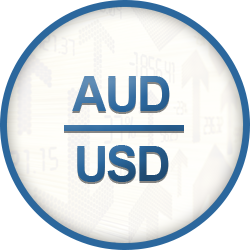 This page offers you the relevant AUD/USD charts which will help you put together a AUD/USD forecast, helping you make more informed decisions for your currency trading activities.